Adolescent Marijuana Use and its Effects on School and Sports | Building A Safer Evansville, Inc. Skill impairment due to marijuana use may last up to 24 to 26 hours after initial use. Did you know that weekly marijuana use under 18 years of age has been associated with an eight-point drop in intelligence among those who develop persistent dependence? 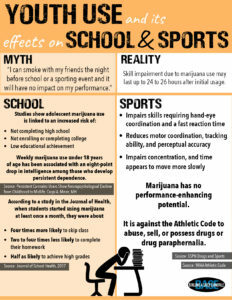 Both school and athletic performance are greatly impacted by adolescent marijuana use. Studies have shown an increased risk of not completing high school, not enrolling or completing college, and an overall lower educational achievement level. When someone smokes marijuana, the THC gets lodged, to greater or lesser degree, in the fatty tissues of the body. The chemical can stay for weeks, months or even longer. This means that a person who continues to smoke marijuana can experience reactions from the drug even when they are not currently using it. These after-effects can occur without the individual realizing what is going on. Marijuana has an adverse effect on the cognitive function of the individual. Attention span, memory, and comprehension can be affected for days, weeks, or longer after the acute effects of the drug have subsided. Students don’t have to smoke marijuana daily for it to having lasting negative impacts. Marijuana use affects school performance in teens even when only smoking recreationally. According to reports from the National Institute on Drug Abuse (NIDA), students who smoked marijuana on a regular basis scored lower on tests compared to those who were not using the drug. A summary of 48 separate studies reported a consistent correlation between cannabis use and lowered educational performance, grades, etc. Some students who aren’t performing well academically in school aren’t allowed to participate in athletics, but for those who still find themselves on the team, marijuana use can mess up their game. THC has obvious effects on the human body: impaired hand-eye coordination, slower reaction time, reduced motor coordination, tracking ability, and perceptual accuracy, impaired concentration, etc. All of these skill impairments can last up to 24-26 hours after use, meaning a smoke session the night before with the team can effect tomorrow’s big game. Not to mention, it is against the WIAA Athletic Code to abuse, sell, or possess drugs or drug paraphernalia.